One killed and three others injured when a vehicle skidded off the road at Gupuks on January 9. The vehicle bearing registration no HR-A 51 AL- 6312 was coming from Nimmo to Leh. The driver was accompanied by three other friends. SI, Tsewang Stanzin, investigating officer of Police Station, Leh said, “We came to know about the incident around 9:00 AM. 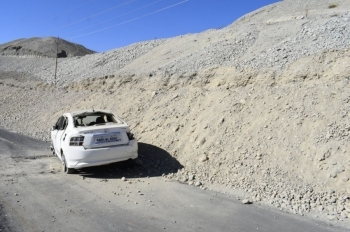 From our initial investigation, we came to know the car was on the way to Leh from Nimoo when it was skidded off the road and fell into a gorge near Gupuks. However, further investigation is going on to ascertain the cause of the accident”. He further informed that a case FIR no 04/2018 U/S Section 279 ( Rash Driving or riding on a public way), 337 (Causing hurt by act endangering life or personal safety of others) of RPC was registered in Police station, Leh. According to the sources, a few locals along with four soldiers of Ladakh Scouts Regiment located in the vicinity rushed to the accident site and immediately shifted the victims to the SNM Hospital, Leh.